A no-deal Brexit is not the UK government's plan A and should not be plan B either, a Welsh MP has said. Talks have resumed in Brussels between UK and EU officials amid growing speculation that the UK could leave the EU without a deal in March 2019. But Stephen Crabb, a member of the Commons Brexit select committee, said that should be avoided "at all costs". His comments came after Foreign Secretary Jeremy Hunt claimed the UK would prosper without a deal. Preseli Pembrokeshire MP Mr Crabb told BBC Radio Wales' Sunday Supplement programme: "Let's be clear, this is not the outcome we would want. "It is the outcome that would have the biggest negative impact on us in the UK and particularly us in Wales. "I think there will be an enormous political cost to the scenario. In fact, it would represent a failed Brexit. It would be a failure of the Brexit process both for ourselves and the EU." Image caption Vaughan Gething says he feels he has a "moral duty to fight back on behalf of everyone in the UK"
Meanwhile, Welsh Labour leadership candidate Vaughan Gething has come out in support of a people's vote on the final Brexit deal. Writing for the Independent on Friday, Mr Gething said: "People voted to instruct the UK government to negotiate a deal on Brexit and they should be getting on with that - but they should also know that we, the people, expect to have the vote on the final deal. "I know there will be voices screaming in Wales that I am betraying the decision of the Welsh people to leave in 2016. "I am backing the final vote on the Brexit deal not because I think it is the most popular option, but because I think it is right that something this important, that will affect generations for generations, is ultimately a decision for the people as a whole." On Thursday, the UK government will publish the first in a series of technical notices designed to prepare the UK for the possibility of a no-deal Brexit. Brexit: What do the EU's 'no deal' preparations say? 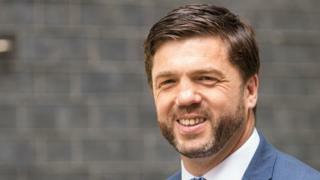 "It's [a no-deal] not the government's plan A, it shouldn't even be plan B, and an awful lot of work is going on in the negotiations to avoid that scenario," said former Welsh secretary Mr Crabb, who voted to remain in the EU. "We're focused on getting a good deal and in my view, the plan that was agreed at Chequers by the prime minister is one that seeks to charter a pragmatic course through the middle of this very difficult and complicated debate, represents the right approach. "In my view, it gives us the best chance of meeting the objectives that were set out in the referendum campaign by the Leave campaign themselves but also gives us the best chance of protecting our international trade position and protecting our jobs." He called on his fellow Conservative MPs to back Prime Minister Theresa May's Chequers plan to push the deal through. UKIP's South Wales West AM Caroline Jones described the UK government's Chequers plan as a "mess" and called on the prime minister to "get on" with Brexit.